on most parts AND labor *whichever occurs first. This means you can leave our facility with confidence that your investment is protected. Welcome to Import Motor Werks, your first choice for stellar auto repair services near Cary & Raleigh. Our talented and very capable auto mechanics are experienced experts who genuinely have a passion for auto repair. Our team is often able to fix automobile problems that other auto repair service centers overlook. 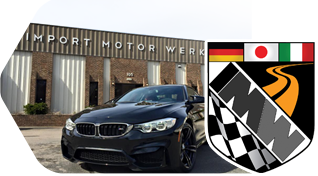 Import Motor Werks has earned many loyal, long-term clients because our dedication to above and beyond auto repair and customer service is truly unmatched. Import Motor Werks is dedicated to offering drivers in and around the Cary & Raleigh areas with first-rate auto repair and customer service. Please call us for preventive maintenance, schedule an appointment online, or visit us at 105 Woodwinds Industrial Court, Cary, NC 27511. You can count on our team of skilled auto mechanics to provide you services that are second to none. We look forward to giving your vehicle premier preventative maintenance work so you and your passengers can feel secure on the roads.